The aircraft above appear aloof; the distance belying the destructive capability. Soon, buildings collapse as a result of the explosions; death rains down from the heavens. At the time, the country was pre-occupied with threat of aircraft attacks; the world had changed profoundly in June of 1942. The first University of Alberta Dean of Law envisioned great things for the Faculty. He hoped for a new international order based on the rule of law. Despite the wartime conditions confronted by John Alexander Weir, K.C., during his tenure, he refused to simply accept the postwar obstacles. He faced them head-on in numerous community meetings and fundraisers, consultations with the government and debates in those early formative years of the law school. Eric McCuaig was a law student then. He recalls the rationing of butter and coffee when the first Dean forged ahead to build his dream, an excellent school of law. Unsurprisingly, Dean Weir and his colleagues George H. Steer K.C. and Wilbur Bowker O.C., K.C. 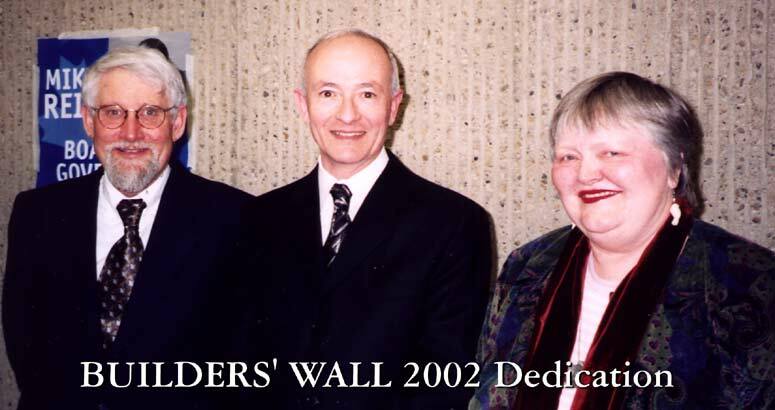 are amongst those chosen for induction into the select group of individuals honoured at the dedication of the Builder's Wall on March 5, 2002. That March afternoon provided a typical Edmonton show of swirling snow for those who peered out the second floor windows. The show indoors was prefered by far, however. McLennan Ross hall was filled with celebrated and notable alumni, faculty, students and guests for the dedication of the University of Alberta's Law School Builder's Wall. Dean Lewis Klar welcomed an extensive list of distinguished VIP's, he then whirled through an impressive herald of past and current triumphs by an extensive list of law school affiliates. Some of the original chief architects and engineers of our law school shared warm smiles and hugs as many of the current team of designers and draughtsmen Professors Hopp, Bell and Carver as wel as Patricia Spencer, to name a few, looked on from the back beaming. They beheld a row of distinguished student mooters - no doubt, a true extension of their esteem and joy. Dean Klar enunciated the importance of the law school community's commitment to excellence at the University of Alberta. He thanked builders, past and present, noting their increased importance at a time when there are tremendous student concerns about the pending tuition hikes; thus he encouraged increased support for efforts against today's mounting challenges to the provision of high quality legal education. He acknowledged the many contributions of those whose names do not appear on the wall, while exhorting all who were present to continue providing increased access to the study of law with gracious generosity. Among those present were the Honourable Justice David C. McDonald, who was important in the 20/20 anniversary celebration in 1992, when preparations for the Wall were planned; Dr. Alexander Smith, Q.C., was dubbed the namesake for The Smith Prize for the Laskin Moot, The Alexander Smith, Q.C. Endowment Fund. The Weir Library is renowned in Canada, thus friends who came out to see Lillian Vilborg MacPherson were proud of her efforts for the development of the computer lab, and the growth of the academic law library. Peter L. Freeman, Q.C. was a major contributor and served as the Chief Librarian for the Supreme Court of Canada. The Alberta Law Review house bears the name of Hon. Justice William A. Stevenson, whose namesake is used in an endowment fund in 1969-1970. Many of the builders were part of Campaign 75 instrumental in the last spurt of growth in the faculty: Roderick A. McLennan, Q.C., also of the Alberta Foundation for Environmental Excellence; Gary Campbell, Q.C. and of course, the Honourable Justice Tevie H. Miller, for whom the teaching prize awarded recently to current builder, Professor Shannon O'Byrne, is named. Gold medallist, the Hon. Justice Peter T. Costigan was also inducted. Few words are needed to introduce Honourable Justice Ellen I. Picard who set up the nationally respected Health Law Institute and Chief Justice Beverly McLachlin, who was also a University of Alberta graduate. The gathering in front of "The Wall" was more akin to a family reunion than an official ceremony. Ever so warmly, Justice Ellen Picard and Chief Justice Beverly McLachlin shared a few moments just before the brief official ribbon cutting. (What a lead to the end of my first year of Law School.) Truly encouraging is the veracity of character of this year's law school students. As I snapped the picture, the group reminds me to rise to the challenge of our innovative and resourceful team of current builders: faculty, staff and students alike. Students who exemplify the tradition of excellence, such as Patrick Duffy (3L), the winner of the Jessup moot last year, was flying to compete in Washington two days after the dedication of the Wall. He encouraged full participation in law school activities. Rosemary Duffy (1L), who won the Dean's citation, said that her brother "does give good advice" and was helpful in dispelling some of the myths about law school. Jennifer Lepp (2L), next year's LSA President, won the Merv Leitch scholarship in Constitutional Law. Deborah Szatylo, who personally drove would-be students to look for apartments on orientation day was awarded the Stanley H. McCuaig Scholarship donated by McCuaig Desrochers, Barristers & Solicitors. This is our law school, our community. These people share something truly special. They are each current builders and contributors of the Faculty, and as Dean Klar asserted in his speech, we are each a part of this legacy.